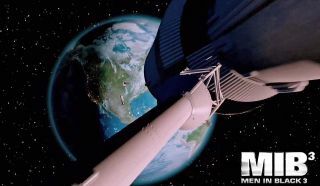 A still from the "Men in Black 3" promotional trailer appears to show a Saturn V rocket staging and launching away from Earth. In "Men in Black 3," opening in theaters Friday (May 25), agents "J" (Will Smith) and "K" (Tommy Lee Jones and Josh Brolin, portraying Jones' younger self) reunite to protect the Earth from aliens once again. This time — and time being a key plot point here — a few more letters get involved: N-A-S-A. "It's a key piece of the film," visual effects supervisor Jay Redd told collectSPACE.com. WARNING:There will be no flash from a memory-wiping Neuralyzer at the end of this story. The following contains spoilers. Will Smith (right) and Josh Brolin (rear left) star in Columbia Pictures' Men in Black 3. "There is no allusion to [NASA] at all until later on in the movie," Redd explained. "But really, the Apollo 11 launch and Kennedy Space Center at Cape Canaveral are integral to the story." In the movie, which is the latest installment in the comic book-based series, Smith's Agent J travels back in time to 1969 after he learns that Agent K's life and the fate of Earth are at stake. The blast into the past coincides with perhaps the most famous rocket launch in history: the July 16, 1969 liftoff of a Saturn V booster, beginning the Apollo 11 first moon landing mission. "The world of 'Men in Black' is kind of a whimsical, wacky and surreal version of reality and to have something like the Apollo 11 launch, which is just full of history, what we wanted to do is start with reality," Redd said. "We explored using stock footage or using some of the original film that was shot during that launch," Redd said. "We worked with NASA and looked through all the footage and [while] it's amazing, we thought it was too low quality for today's high definition digital projection standards." The film's director, Barry Sonnenfeld, also wanted to show the launch from different angles or views than what had been captured in the iconic film from the actual mission. "We always try to start with our foot in reality and then say 'How can we bend and twist and kind of art direct reality into our world, the world of Men in Black?'" said Redd. "And because there's a wackiness to it and an adventure roller coaster ride, we kind of peel away layers before it breaks." The goal, explained Redd in recreating the real world like the Apollo 11 launch, is to make sure the audience feels immersed in the movie. "If we break it too much, then it takes people out of the world [in the film]," he said. To make sure the launch felt authentic, Redd together with his fellow visual effects supervisor Ken Ralston visited NASA's Kennedy Space Center in Florida, where the real Saturn V launched four decades ago. "We went down to Cape Canaveral a handful of times and worked with NASA media relations to get up on the launch pad where shuttle Endeavour was at the time, and really take a lot of detailed photos of the machinery that was there, the landscape and then we compared all of that with as many photographs and detailed references we could find," Redd said. "We compared what was there in 1969 to what was there now." "We looked at hundreds of photographs and we got some basic schematics and blueprints from NASA. They were extremely helpful in the process," he said. Tommy Lee Jones stars in Columbia Pictures' action adventure comedy Men in Black 3. In addition to conducting research at the Kennedy Space Center, the filmmakers also shot scenes to set the stage for the launch, literally. "We did extensive panoramic photography, the landscape and cloud formations, to use as backdrops for what would later be shot set against blue screens," explained Redd. "Then we created digitally the launch tower, the Vehicle Assembly Building, and all the machinery because there are some big helicopter shots that zoomed from far away showing the entire rocket, moments away from launching, all the way to the close-up of an actor in one shot." As much as they would have liked to shoot on location, the logistics of the launch required replicas being created. "We built a two-story piece of the launch tower on a set and tried to stay true to the spirit of what that tower looked like but we didn't actually film on the actual launch tower," Redd said. "As you can imagine, the weather changes a lot and we were shooting the sequence with stunt people and cables, rigs and lights and that's a lot of things to try to shoot 15 to 20 stories up in the air." Continue reading at collectSPACE.com to learn what visual effects supervisor Jay Redd said about trying to balance telling a story with telling history in "Men in Black 3."